You know how the Israeli government is meant to be in favour of allowing a Palestinian state? Read the quotes below and you’ll see that Netanyahu and every minister in his government have been saying the opposite to Israelis for years and taking the whole world for mugs. “I will do everything in my power, forever, to fight against a Palestinian state being founded in the Land of Israel.” - Naftali Bennett, Israel's Minister of Industry, Trade and Labor, January 2013. “In this way, we will try, slowly but surely, to expand the circle of settlements, and to afterwards extend the roads that lead to them, and so forth. At the end of this process, the facts on the ground will be that whatever remains [of the occupied West Bank] will be merely marginal appendages…” - Yariv Levin, Coalition Chairman in the Knesset for Benjamin Netanyahu's ruling Likud Party, January 2013. "One thing must be clear: A Palestinian state is not the solution. The state of Israel made a harsh mistake when it created the impression that it is prepared to accept two states for two nations. ”- Uzi Landau, Israeli Minister for Tourism, May 2013. “This is our land, and it’s our right to apply sovereignty over it. Regardless of the world’s opposition, it’s time to do in Judea and Samaria [the occupied West Bank] what we did in [occupied East] Jerusalem and the Golan.” - Ze'ev Elkin, Deputy Foreign Minister of Israel, July 2012. “We are opposed to a Palestinian state... [Netanyahu's declaration of support for a Palestinian state at Bar-Ilan University was] a tactical speech for the rest of the world. ” - Tzipi Hotovely, Deputy Minister of Transportation, December 2012. “The Land of Israel belongs to the Jewish people. We oppose a two-state solution.” - Avi Wortzman, Deputy Minister of Education, February 2013.
exact targets and that we gave them advance warning. Gaza is part of our Land and we will remain there forever. Liberation of parts of our land forever is the only thing that justifies endangering our soldiers in battle to capture land. 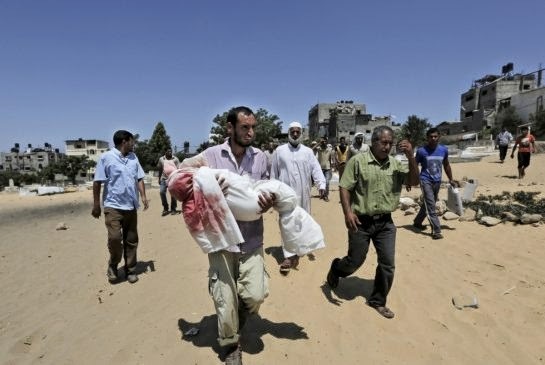 Subsequent to the elimination of terror from Gaza, it will become part of sovereign Israel and will be populated by Jews. This will also serve to ease the housing crisis in Israel.” – Op-Ed by Moshe Feiglin, Deputy Speaker of the Knesset and member of Benjamin Netanyahu’s ruling Likud Party, July 15 2014. How is this any different from Hamas spokespeople who repeatedly tell foreign journalists and politicians that they back a two state solution, while telling their own people that they will never give up an inch of the former Mandate of Palestine? There is one way it’s different. 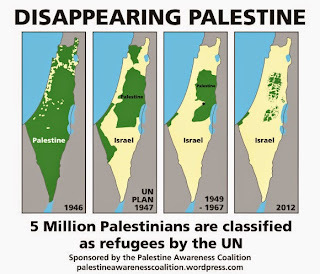 Hamas don’t have even 1% of the military power to destroy Israel, but Israel has more than enough military power to make every Palestinian they don’t kill into a stateless refugee. The blockade on Gaza and refusal to negotiate with the entire elected Palestinian government – Hamas and Fatah – are about creating a never ending war with Hamas to distract the world’s attention from the fact that Israel doesn’t intend to ever give up an inch of the West Bank, ever allow Palestinians the same rights Israelis have. How can any politician believe any longer that the Israeli government has any moral superiority over Palestinian groups’ leaders? 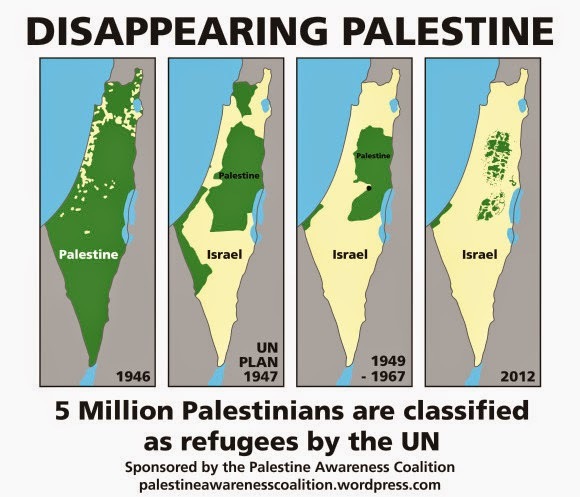 Every government should be demanding that Israel provides Palestinians with either their own sovereign state in the West Bank and Gaza, or else provides all Palestinians with full and equal citizenship in a single binational Jewish and Arab state.